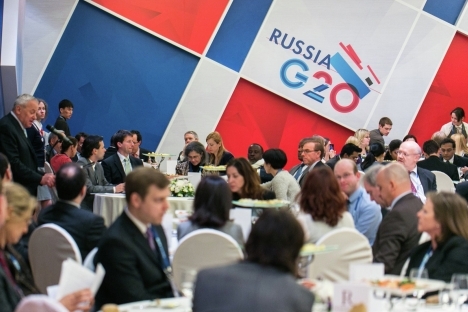 Russia, which is chairing the G20 in 2013, does not want to discuss the management of the exchange rates of national currencies and the bank crisis in Cyprus during the G20 meeting in Washington on April 18-19. Russia, which is chairing the G20 in 2013, does not plan to propose that the group's finance ministers and central bank governors discuss the management of the exchange rates of national currencies or the bank crisis in Cyprus when they meeting in Washington on April 18-19, a source in the Russian delegation told reporters. He said this meeting of the financial G20 will be shorter than the one held in Moscow in February and the communique issued after the meeting will be shorter than the one issued then. The list of issued that Russia will propose for discussion will be the traditional ones: the global economy, the state of financial markets, the framework agreement, debt issues, financial regulation and financing of investment. "We don't plan to include [in the communique] anything about currency wars. Last time, there was an objective need to discuss the situation, namely the last decisions of the Japanese government," the source said. He said that in February the ministers stated that this issue needs to be monitored, but that there was absolutely no reason "for any panic, for mutual accusations, far less any kind of confrontation." "Therefore, there are no grounds to bring this topic up again now. In my view, we dotted all the i's in February," he said. The communique, he said, will as usual reflect a position on exchange rate policy. "I can't say anything about this at the moment. We'll see in what formulation this will be said. There are no grounds for any alarmist statements, I don't expect any loud commentaries on this subject," the source said. The agenda for the meeting in Washington does not include the situation in Cyprus. "We didn't plan to, and the agenda doesn't include such an issue - the situation around Cyprus," the official said. However, he said this issue would likely be raised by other participants in the meeting. "It's obvious that the other participants in the meeting will not skirt this, because within the context discussing the situation in the global economy and financial markets we do a report of what happened in the past two months and this is one of the most glaring events, which is impossible to ignore," he said, referring to the crisis in Cyprus. However, he does not expect the discussion of this issue to be very stormy. "I'm not inclined to think that this will be some excessively severe discussion with mutual recriminations, after all, this problem doesn't even exist for half the G20 countries. Certainly, I expect that in certain remarks, assessments, commentaries this issue will be raised," he said. European ministers, for example, might respond that "this issue is internal and this issue is resolved," the source said. "It's impossible to avoid mentioning this issue. On the other hand, there's of course no need to expect that the ministers will discuss only the aspects of the situation in Cyprus' banking system in all their detail for 2-3 hours," he said. The terms for restructuring Russia's loan to Cyprus is also unlikely to be discussed on the sidelines of this meeting, since Cyprus' finance minister and central bank chief will not be coming to Washington. The ministers are also unlikely to spend much time discussing the reform of International Monetary Fund quotas. "This is a sad subject. There essentially won't be anything. Because it's not constructive to discuss the formula, the next, fifteenth addition, while the issue of the fourteenth hasn't been decided and the question concerning the decisions of 2010 has not been closed," the source said, adding that the new redistribution of quotas is supposed to be based on the previous one, which never went into effect. He said the process of putting earlier decisions on the recapitalization of the IMF is being held up by the United States. "It's difficult to criticize the administration, because they objectively have problems in Congress. On one hand, everyone understands these difficulties, on the other it turns out that the G20 is a kind of hostage to the situation," he said. "Since there is no progress on the American side, no decision has been made and the amendments of 2010 did not go into effect, not much time will be devoted to discussing this issue." G20 leaders decided at a summit in 2010 that the formula for distribution of IMF quotas should be revised in light of the new realities in the distribution of forces in the global economy. This was supposed to be done by the beginning of 2013, but the process has stalled. Now the new formula is supposed to be agreed and quotas calculated by the start of 2014, which was originally the deadline for the final stage of the reform. In the February communique, the G20 ministers and central bankers said they took under review a decision by the IMF board of directors to combine the process of reaching a final agreement on the new formula with the 15th general review of quotas. They also said they would redouble their efforts to reach an agreement on the formula for calculating quotas and complete the review of quotas by January 2014. The finance ministers of the BRICS countries will also hold a meeting in Washington during which they will discuss a list of future steps, the source said. "I don't expect anything large-scale, since BRICS leaders and ministers met three weeks ago. Exactly nothing has happened on these issues in three weeks," he said. Speaking about possible bilateral meetings that Russian Finance Minister Anton Siluanov might hold, the source said a meeting is planned with the new U.S. Treasury Secretary Jacob Lew. A meeting is also expected with Dutch Finance Minister Jeroen Dijsselbloem, the chairman of the Eurogroup.